Databases servers, web servers and any other type of server software used in the organization have to be up-to-date and regularly patched in order to adhere to this part of the GDPR. The nature, scope and purpose of the data processing an organization performs also needs to be documented. Data must also be stored appropriately. For example, credit card data has to be handled one way, whereas email addresses will be handled a different way. Generally, the rule is that it's best to store the minimum amount data possible in order to perform a specified task. Personal data should be pseudonymised (for example, by replacing names with unique identifiers) and encrypted where possible. Ongoing confidentiality, integrity, availability and resilience of processing systems and services must be ensured. In other words, all data should be readily available to users, and provisions should be made to ensure that it is not read or tampered with by unauthorized persons, whether accidentally or on purpose. Organizations must implement a process for regularly testing, assessing and evaluating the effectiveness of technical and organizational measures that are designed to ensure the security of processing. In other words, organizations shouldn't blindly rely on established security measures, but proactively test them in order to see whether or not they work as intended. In the case of web applications, this would include penetration testing and regular application vulnerability scanning. Article 32 further states that organizations must consider the risks that are presented by processing personal data. These risks might take the form of accidental or unlawful destruction, loss, alteration, or unauthorised disclosure of personal data. It also includes how personal data is accessed, transmitted and stored. This GDPR section closes by reiterating that only authorized persons should process data when they are required or instructed to do so. Implementing the varying aspects of the GDPR regulations remains a challenge for many organizations. To help you get started we have written a white paper, The Road to GDPR Compliance – a high level overview of what organizations should do in order to become GDPR compliant. One way in which the technical security measures referred to in the new GDPR regulations can be implemented is by establishing a procedure for regular scans with web application vulnerability scanners. 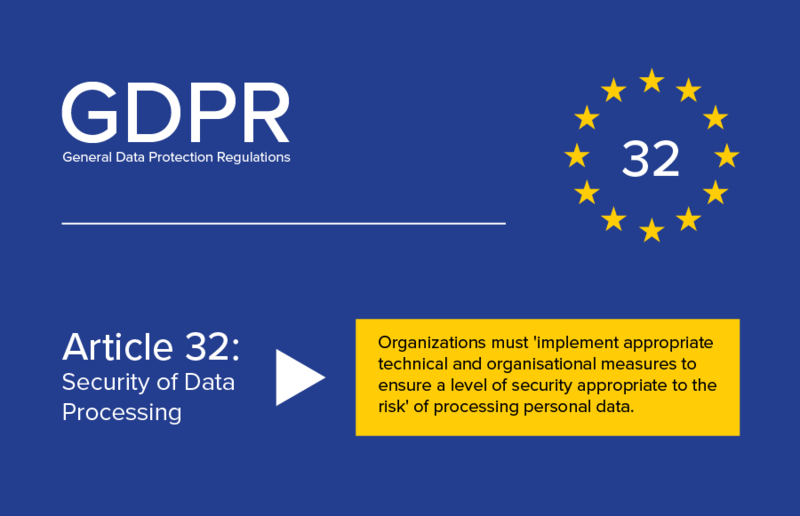 So get in touch with us to learn how Netsparker can help your organization ensure it complies with the GDPR Article 32.